Margery was born in Kenwyn, on the outskirts of Truro in Cornwall on 5th May 1932 to Percival and Alice Birch. Margery already had an older sister, Sheila, and a younger sister, Catherine, was to follow. Margery attended the local St Paul’s Infants School, and then St Paul’s Juniors. She must have done well in these early years as she was awarded a place at Truro County Grammar School for Girls. Here she continued to excel, eventually becoming Head Girl. Margery took up a place at Gloucester College to study Domestic Science in 1951. Her first teaching post was in Cornwall, then she moved to Churchdown Secondary Modern School in Gloucestershire as a Domestic Science teacher. Former pupils remember her as being very strict but fair. Margery’s lifetime involvement with bell ringing began when she learnt to ring at Kenwyn. Shortly after moving to Gloucester she rang her first peal, Grandsire Doubles at Great Witcombe, Gloucestershire, conducted by Leslie Barry, the Gloucester Cathedral tower captain. During the late 1950s, Margery met Cyril Wratten at the wedding of a mutual ringing friend at Truro Cathedral. They were married at All Saints, Hartley, Kent on July 30th 1960. By this time Cyril was already tower captain of Cheltenham Parish Church, and together they did much to improve the ringing and the team spirit of the local band, and ensured good quality service ringing. Over the next thirty years they organised day outings, weekends and week-long ringing holidays; these were always well planned, with precise schedules, enabling us to visit and enjoy many of the finest rings of church bells in the British Isles. During the 1960s Margery and Cyril arranged a number of ringing tours, ‘Westward with Wratten’ and ‘Wrattens’ (W)ringers’. In 1969 Margery helped Cyril in the founding of the ‘East meets West’ peal tour which is still going today. 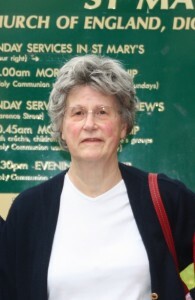 Margery served the Gloucester and Bristol Association as Peal Secretary from1965 to 1970; this involved recording the performances and the compositions, and receiving and banking the peal fees. Margery and Cyril’s only child was born and died on 20th October 1972. At this time Margery took a break from teaching and trained as a typist and secretary, but she eventually returned to her true vocation and became Head of Home Economics at Cheltenham Ladies College. Margery remained in this post until she retired. In 1971, Cyril was elected Secretary to the Central Council of Church Bell Ringers. Margery immediately gave him support well above and beyond the call of duty; just one year later when she attended the Central Council meeting as Cyril’s assistant her contribution was immediately recognised, and she was elected an Honorary member of the Council there and then. She held this post for the next twenty one years. She attended many functions, took on some of the secretarial work and answered the many varied phone calls relating to bells and to ringing. On one occasion the personal assistant of a novelist called to check facts regarding ringing during the First World War and Margery was able to re-write the paragraph of the novel over the phone so that it would make sense to ringers and non-ringers alike. Margery’s creative side shone through in her embroidery with examples of her work decorating their house and given to others as gifts. She tried many different techniques, enjoying day courses, lectures and exhibitions. She was an active member of the Cotswold branch of the Embroiderers’ Guild for many years, taking her turn as Chairman. Margery was actively involved in the Parish Church of St Mary’s Cheltenham. She was Tower Secretary for many years and was Tower Captain from 1997 until 2004. She followed Cyril who had been Tower Captain from 1959 to 1997, so between them they served in this capacity for 45 years. Margery’s involvement with the church extended far beyond bell ringing. As a member of the Church Watch team she welcomed visitors to the church and took her turn leading the lunchtime prayer service. At the sister church of St. Matthew’s, Margery volunteered as an office administrator; was an enthusiastic member of the Barnabas Group for people ‘on their own’ and helped as a driver for their outings as well as transporting the elderly members of the Thursday Club to and from their meetings. When St. Matthew’s church installed a new kitchen, Margery’s expertise was called upon to teach hygiene and kitchen management and to persuade her adult pupils, who thought they had finished their exams many years ago, to obtain hygiene certificates. Margery regularly attended the afternoon bible study held at St. Matthew’s church and served on the Parochial Church Council. Margery was secretary of the ‘Friends of St. Mary’s’ for many years and this proved to be a very challenging role. Having realised that there was the possibility of St. Mary’s being made redundant she informed the members that she believed this to be the case, and once aware of the opposition to this idea, galvanised the members into action. Cyril’s worsening condition forced her to give up being secretary but she served on the committee until 2012 and was hugely supportive. She was thrilled when the church was inaugurated as Cheltenham Minster. In retirement, Margery and Cyril joined a local winemaking club but sadly Cyril’s illness became apparent soon after. They were both still able to enjoy their regular walks with the Rambling Club – indeed younger people had difficulty keeping up with them! Margery rang forty nine peals in all, a modest total number, but her achievements included Stedman from Doubles to Cinques, Grandsire from Doubles to Cinques, and Yorkshire from Major to Maximus. She also rang several of the Standard Eight Surprise Major methods, as well as Kent Treble Bob Major, Oxford Treble Bob Major, Oxford Bob Triples and Double Norwich Court Bob Major. Margery was a modest and very private person. Her cancer was out of bounds as a subject of conversation, not because of embarrassment or fear but because of her determination to lead her life as normally as possible for as long as possible. Margery continued to ring for Sunday services until she ceased treatment in July; she passed away on 19 December 2013.Margery will live on through those whom she taught to ring, through Cheltenham Minster and its bells and through those who received excellent tuition in home economics. Beckford, Worcs 28 December 2013 1272 Norwich Surprise Minor1 Madeline Reeder 2 Alison R Williams 3 Stuart Piper 4 Steve Bowley 5 Roy Williams (C) 6 Andrew Evans In memory of Margery Wratten and Ellen (Nellie) Bowley, Auntie of Steve. Abson, Glos 8 January 2014 1272 Spliced Surprise Minor Carlisle, Chester & Munden 1 Ian R Fielding 2 Simon D G Webb (c) 3 David A C Matthews 4 Elizabeth A Evans 5 Malcolm N Evans 6 Philip M Pratt In memory of Geoff Clark and Margery Wratten. Cheltenham, Glos St Mary 12 January 2014 1320 Grandsire Cinques 1 Simon Ridley 2 Chris Hickey 3 Liz Coke 4 Mike Seagrave 5 Hugh Evans 6 Hilda Ridley 7 Pat Hickey 8 Alison R Williams 9 Mark Davies (C) 10 Roy Williams 11 John Ridley 12 Liz Evans In memory of Margery Wratten. Cheltenham, Glos St Mark 15 February 20141260 Stedman Triples1 Quentin S A Jackson 2 Clara Jackson 3 Alison R Williams (c) 4 Hilda C Ridley 5 Michael Seagrave 6 Hugh N Evans 7 Simon J Ridley 8 Roy WilliamsRemembering Margery Wratten.